Hyde Park, NY – The Culinary Institute of America (CIA), in collaboration with Suntory Group, one of the world’s leading consumer product companies, launched the second year of its Advanced Cooking: Japanese Cuisine course at the college’s New York campus. As Japan’s rich culinary traditions, techniques, and dishes increasingly become focal points of exploration for young chefs pursuing advanced culinary arts, the course serves as the first phase of a broader Japanese studies initiative at the CIA. This year, students enrolled in the course had the opportunity to travel to Japan to experience Japanese cuisine first-hand, just before the start of the semester. The 10-day culinary tour was an enlightening experience for the students and set the tone for what they are learning back on campus. The tour was made possible by Suntory and other corporate members of the CIA’s Japanese Studies Leadership Council. 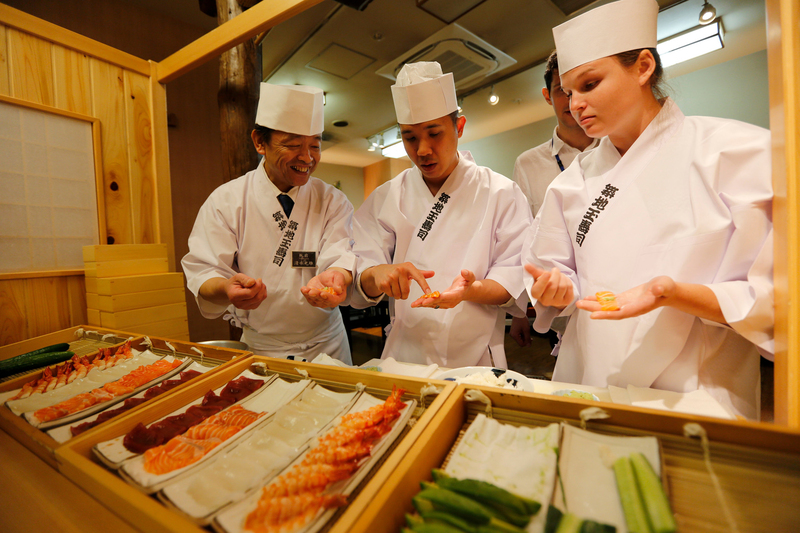 Students and CIA faculty traveled to Tokyo, Fukuoka, Kyoto, and Osaka, experiencing cuisines and culinary demonstrations ranging from soba and sushi to kamameshi, okonomiyaki, kaiseki, and much more. The itinerary included visits to rice fields grown for vinegar production, wagyu beef and bamboo shoot farms, the Tsuji Culinary Institute, and the Suntory Yamazaki Distillery. The tour was planned by the CIA with the help of the college’s ambassador in Japan, Mr. Hiroo Chikaraishi, a well-known hospitality expert based in Tokyo. The Japanese Cuisine course is an innovative immersion into the cuisines, flavors, techniques, and food culture of Japan. It is jointly taught by CIA instructor Chef Martin Matysik and Chef Hiroki Murashima of the world-renowned Tsuji Culinary Institute in Osaka. As part of the CIA’s relationship with Suntory, Chef Murashima also holds the position of Suntory Visiting Professor of Japanese Studies. The elective, open to juniors and seniors pursuing a CIA bachelor’s degree, started in September, and is filled to capacity. The course will include a day-long field trip to New York City to experience leading Japanese restaurants and retail operations. The curriculum guides students through Japanese history, culture, and principles of authentic Japanese cooking as they explore rice and noodles, sushi, tempura, the principles of umami, and the cultural aspects of the Japanese dining table. Students will also learn the art of preparing kaiseki, a traditional multi-course meal that is highly seasonal, balanced, and evocative of Japanese sensibilities of beauty and hospitality. Suntory Group is among the world’s leading consumer products companies, with $24.3 billion in annual sales. We offer a uniquely diverse portfolio of beverage products enjoyed by millions around the world: from award-winning Japanese whiskies Yamazaki and Hibiki, The Premium Malt’s beer, and iconic American spirits Jim Beam and Maker’s Mark to non-alcoholic favorites Orangina, Lucozade, and Ribena. Suntory also produces wellness products and operates a flower business. Founded as a family-owned business in 1899 in Osaka, Japan, Suntory Group has grown into a multi-national corporation, with operations throughout the Americas, Europe, Asia and Oceania. We are driven by Yatte Minahare—the spirit of bold ambition—and our 38,000 employees worldwide draw upon our unique blend of Japanese artisanship and global tastes to explore new product categories and markets. Learn more about Suntory Group, its brands, and its commitment to social responsibility at www.suntory.com, us.suntory.com, on facebook.com/SuntoryGlobal or @SuntoryGlobal on Twitter.